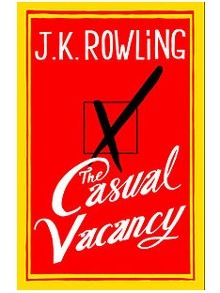 Despite all the indifferent to bad reviews, I still want to read JK Rowling’s "The Casual Vacancy". However, with no desire to start reading the 500 page tome straightaway, today I reserved a copy at Cambridge Central Library. Now, according to their online catalogue the book isn’t actually on the shelf yet but is ‘on order’. The system is clever enough to allow me to reserve it for when it does arrive – though to my horror, I discovered that I am in a queue with 102 people ahead of me. Considering that you’re allowed to have the book at home for 3 weeks this means that – assuming people borrow it for the maximum period – it will be at least 6 years before I can check it out. Of course, taking into account the book’s not inconsiderable length, plenty of people will need longer than 3 weeks to read it and will be more than happy to incur the modest daily fine the library charges. In other words it might take up to a decade before I start reading it! Now the library might decide to order more copies considering the demand is so high – though I note that there are still 126 holds on "Fifty Shades of Grey" so they haven’t quite kept ahead of trends in adult fiction (or perhaps, just aren’t willing to succumb to it).